Green River has erected a statue of explorer John Wesley Powell in front of the Sweetwater County Historical Museum, which is housed in a rehabilitated historic post office (1932). Green River (population 11,808), the county seat of Sweetwater County, was first settled in the late 1860s on the banks of its namesake river, surrounded by spectacular multi-colored buttes. These rock formations were the subject of famous painters such as Thomas Moran, and served as important landmarks and attractions for travelers passing through Green River on the Overland Trail, the Union Pacific Railroad, and the Lincoln Highway. The Green River Historic Preservation Commission has published a guide to the natural wonders of the area that highlights the role that they have played in the historical development of the community. It was from Green River that John Wesley Powell started his famous explorations of the Green River, the Colorado River, and the Grand Canyon. 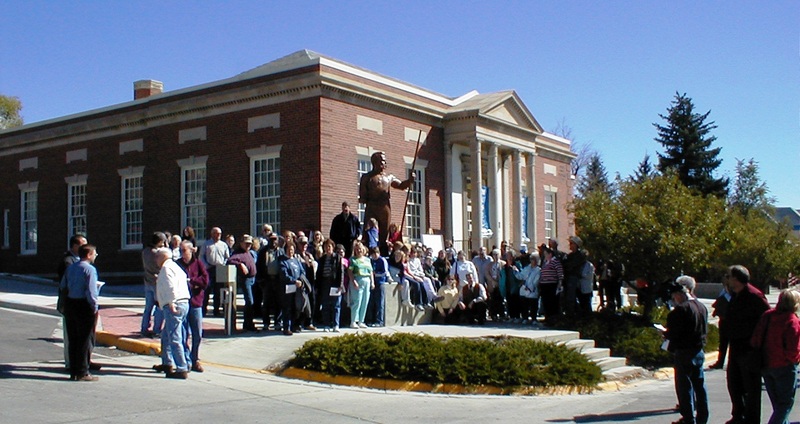 The community recently erected a statue of Powell in front of the Sweetwater County Historical Museum. The museum is housed in the recently renovated historic post office (1932), an anchor building in the historic downtown. Green River promotes tourism to the museum and other sites by participating in Tracks Across Wyoming, an initiative that promotes heritage tourism in the I-80/Union Pacific Railroad Corridor across southern Wyoming.